AAA Minicabs - Airport Transfers in Beckenham, Bromley & Croydon. Whether you require Taxis, Minicabs or Airport Transfers in Beckenham, Bromley & Croydon, with the AAA Minicabs app, you can book a private hire vehicle in minutes. Whether you’re headed to a business meeting or you need us for airport transfers to any of the airports in London, our app was designed with convenience in mind. 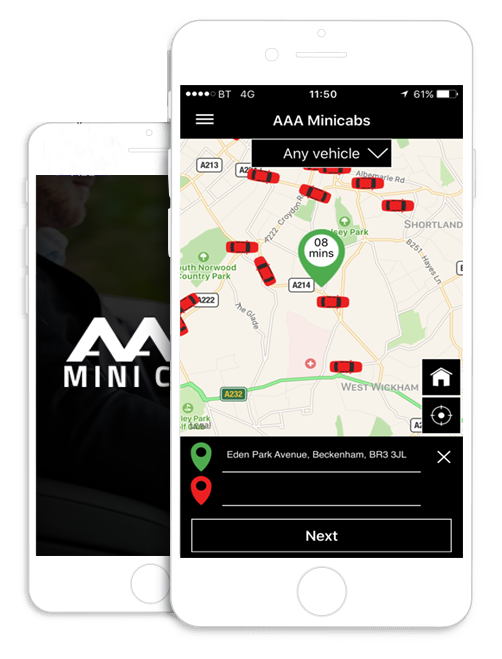 From amending bookings to vehicle tracking, download the app today to take advantage of everything AAA Minicabs has to offer. For single travellers and small groups, our Saloon cars have room for four passengers and two pieces of luggage. Accommodating four pieces of luggage and four travellers, our Estate vehicles offer extra comfort. For groups of up to six, our MPV vehicles were designed to deliver comfort and space. Designed for larger groups, our executive MPV vehicles are the perfect solution for travelling in style. Delivering comfort and elegance, our executive vehicles were designed for clients who want to travel in style. With AAA, you can take your time. Our drivers will wait for up to 60 minutes on airport transfers, and for up to 15 minutes on all other jobs. At AAA, we believe in fair and consistent pricing. There are no hidden fees – just clear, fixed rates which are confirmed when you make a booking. Our prompt and efficient service is available at all major airports in London and designed for both single business travellers and large group bookings. We understand that your plans can change at the last minute, so we offer free cancellations up to an hour before a one-way ride, and 24 hours before hourly bookings.